There’s no way Obama’s secretary paid a higher effective tax rate than the Obamas. You don’t believe it? Are income taxes such a mystery that we can’t figure it out? Well, let’s run the numbers and see. 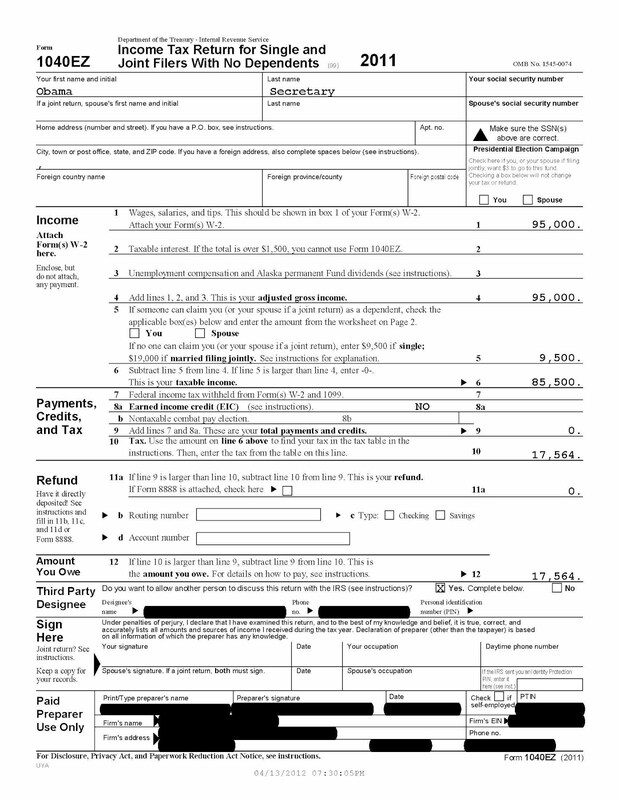 According to Jake Tapper of ABC News, Mr. Obama released his 2011 federal income tax today, with he and his wife reporting an adjusted gross income of $789,674. The Obamas paid $162,074 in total tax – an effective federal income tax rate of 20.5%. The only problem with this story is that Amy Brundage doesn’t know how to compute a tax return, or an effective tax rate. If Ms. Breckenridge were single, made wages of $95,000, and had no other dependents or deductions, her standard deduction would have been $5,800 and her personal exemption $3,700. So taking Ms. Breckenridge’s income of $95,000 and subtracting her deductions of $9,500 results in taxable income of $85,500, and a total income tax of $17,564 (click the tax return image below to enlarge). Thus, her effective tax rate is 18.4% (17,564 / 95,000). The last time I checked 18.4% was less than not greater than 20.5%. Is the Obama Administration so delusional that it believes the American public doesn’t understand basic math? Get a clue! Or ask an accountant. In my opinion we’re all paying way too much for the incompetence of this government. The mainstream media should be ashamed for not verifying the numbers. And Obama’s definitely on the wrong track, one which should (should have) lead to the end of his short and sorry career. That suits me fine. Note: What I have calculated above is the maximum effective tax rate possible for a single person with $95,000 of gross income. However, if Ms. Breckenridge is married her tax rate will be lower, if she has dependents her total tax will be reduced, if she owns a home and pays mortgage interest, gives to charity, or pays a substantial amount in State taxes she could itemize deductions on Schedule A, any combination of which would make her effective tax rate substantially lower than 18.4%. If she's married, has dependents, owns a home, gives to charity, or pays a substantial amount in State taxes, she could itemize her deductions using Schedule A, which would make her effective tax rate substantially less than the 18.4% I calculated here. What I am showing is her maximum possible effective tax rate.